Two Florida Republicans, Sen. Marco Rubio and Rep. Mario Díaz-Balart, have asked President Donald Trump to consider an investigation into whether Cuba’s former ruler, Raúl Castro, should be indicted for the 1996 shoot-down of two Brothers to the Rescue planes. The shoot-down by Cuban military planes resulted in the deaths of three U.S. citizens — Carlos Costa, Armando Alejandre and Mario de la Peña — as well as the death of Pablo Morales, a U.S. permanent resident. “We urge you to consider new, additional actions to hold the Castro regime accountable for its crimes. For that reason, within all applicable rules and regulations, we urge you to direct the Department of Justice to review whether Raúl Castro should be indicted for the illegal and heinous act” of shooting down the two civilian aircraft in international waters, Rubio and Díaz-Balart said in a letter they sent to the president on Monday. Brothers to the Rescue made volunteer flights in the Straits of Florida to search for Cuban rafters who had fled the island by sea. The organization also made flights inside Cuban territory to drop pamphlets denouncing the government of the late Fidel Castro. At the time, Raúl Castro was the minister of Cuba’s Revolutionary Armed Forces. Cuban authorities asked the U.S. government to ground the flights, but they continued and on Feb. 24, 1996, two Cuban military planes shot down two of the Brothers to the Rescue planes. In 2003, a U.S. federal court in Miami indicted three Cuban officials on charges of murder, but Raúl Castro was not among them. None of them were tried. Gerardo Hernández, leader of a Cuban spy ring known as the WASP network, was sentenced to life in prison in connection with the shoot-down but he was freed by the Obama administration as part of a prisoner exchange. The five Cuban spies recently released from U.S. custody spent a second day in Venezuela being hailed as heroes and bestowed with honors. On Tuesday, President Nicolás Maduro honored the men at the National Pantheon, where South American liberator Simon Bolivar is interred, saying that they helped stop “dozens” of U.S. attacks on Cuba, including the bombing of hotels and the killing of foreign tourists. “They declare war when there needs to be war and they pardon and turn people into angels when they need to be pardoned and turned into angels, even if that person is the world’s biggest murderer,” he said. The five men were convicted in 2001 of infiltrating South Florida military installations and spying on the exile community. They were also linked to the 1996 shoot-down of two Brothers to the Rescue planes that killed four exile pilots over the Florida Straits. The last imprisoned members of the spy ring were released in December as Washington and Havana began rapprochement talks. Their release coincided with Cuba’s freeing of USAID contractor Alan Gross. The men are expected to be in Venezuela — Cuba’s closest ally — through Saturday. The brother of one of the South Florida pilots shot down and killed by Cuban MiGs 18 years ago says he will pursue his lawsuit demanding that U.S. prosecutors submit evidence of murder against Fidel and Raúl Castro to a grand jury. “I don’t understand what these prosecutors have been doing all this time,” said Nelson Morales, 66, whose brother Pablo was killed in the Feb. 24, 1996 shootdown along with Carlos Costa, Armando Alejandre and Mario de la Peña. Morales filed suit last year to force U.S. prosecutors in Miami to present to a grand jury any evidence of the Castro brothers’ guilt in the deaths, including recordings and interviews in which they accept responsibility for downing the planes. The federal prosecutors filed murder charges against Gen. Ruben Martinez Puente, who commanded Cuba’s air defense in 1996, and brothers Lorenzo Alberto and Francisco Pérez Pérez, who piloted the MiGs. But they did not indict the Castro brothers. U.S. Judge Donald H. Graham rejected Morales’ suit last month, ruling that the petitioner sought to encroach on prosecutorial discretions and that Morales had not met one of the technical requirements of the law. Attorney Juan Carlos Zorrilla, who represents Morales, has filed a notice of appeal to the 11th Circuit Court in Atlanta. He argues that the lawsuit seeks only to force the prosecutors to present the evidence to a grand jury. The grand jury and prosecutors can then decline to pursue the case, the attorney added. Zorrilla said Morales will separately attempt to resolve the technical issue by seeking a meeting with the federal prosecutors in Miami to personally turn over the evidence against the Castro brothers and ask that it be presented to the grand jury. Former U.S. Attorney Kendall B. Coffey and Brothers to the Rescue leader Jose Basulto presented much of the evidence to the prosecutors in 2008, but Graham ruled the law required that Morales himself present the evidence. Zorrilla filed the “writ of mandamus” — a request for a court order requiring the government to take action — in July to force prosecutors to submit any evidence implicating Fidel and Raúl Castro in the deaths. Prosecutors also should inform the grand jury that it can vote to pursue an inquiry on its own, the lawsuit added. Seventeen years after Cuban MiG warplanes killed his brother and three other South Florida men, Nelson Morales says he still wants to punish the two people responsible. “We are still searching for justice, to prosecute the two principal murderers, Fidel Castro and Raúl Castro,” said Morales, whose brother Pablo died in the shootdown of two unarmed Brothers to the Rescue airplanes. So the Miami maintenance worker has filed a legal demand that U.S. federal prosecutors submit evidence to a special grand jury in South Florida showing the Castro brothers’ guilt in the 1996 shootdown. “I don’t know why they haven’t done this before. I can’t speculate. But it is the right thing to do. Let the grand jury decide whether to indict the Castros,” said lawyer Juan Zorrilla, who is handling the Morales suit. Prosecutors also should inform the special grand jury that it can pursue an investigation on its own, force the U.S. attorney’s office to produce evidence implicating the Castros and request that federal charges be filed against the brothers, the complaint added. Assistant U.S. attorney Eduardo I. Sanchez filed a reply last week asking U.S. District Court Judge Federico Moreno to throw out the demand because Morales does not have the legal standing to file such a complaint. Morales’ complaint also failed to prove that he was personally harmed by his brother’s death, and showed that he had not exhausted all of the legal avenues available to him for seeking redress, Sanchez added. Moreno has not ruled. 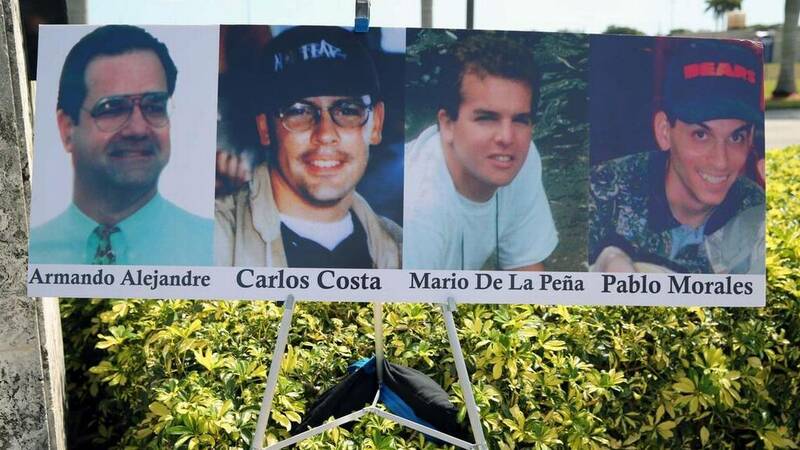 Pablo Morales, Carlos Costa, Armando Alejandre and Mario de la Peña were killed Feb. 24, 1996, when Cuban MiG fighters shot down two single-engine Brothers to the Rescue (BTTR) airplanes. Their bodies were never recovered. “They killed him. They assassinated him. They pulverized him,” Nelson Morales said. Cuba had complained that BTTR airplanes had dropped anti-Castro leaflets over Havana earlier in 1996, and that the two airplanes were shot down in Cuban airspace. An investigation by the U.N.’s aviation branch concluded that the planes were shot down far out in international airspace and in violation of established procedures. Federal prosecutors in Miami filed murder charges in August of 2003 against Gen. Ruben Martinez Puente, who was head of Cuba’s air defense in 1996, and brothers Lorenzo Alberto and Francisco Pérez Pérez, the pilots of the two MiGs. But they did not indict either of the Castro brothers. Zorrilla said he has been working for several years on the mandamus demand with the backing of the Juridical Rescue Foundation headed by Santiago Alvarez, a Miami developer and anti-Castro activist jailed for 30 months on an illegal weapons charge. Former U.S. Attorney Kendall B. Coffey first urged the federal prosecutors to submit the evidence against the Castro brothers to a grand jury about five years ago, Alvarez said. Zorrilla said the toughest part of the demand was that it could be filed only when a special federal grand jury, which usually investigates public integrity and national security cases, was active. But the very existence of grand juries is usually secret. He eventually figured out that no such grand jury was active in South Florida, he added, although U.S. law requires that one always be impaneled in any court district of more than 4 million people. South Florida’s district has 6.3 million people. On May 10 of this year, a special grand jury was created in the South Florida district, Zorrilla wrote in the demand. Seven weeks later, he filed the writ of mandamus on behalf of Nelson Morales. Pablo Morales was 29 years old, trained as a cartographer in Cuba but working as a carpenter and delivery-truck driver in Miami, when he volunteered to join BTTR flights designed to spot rafters in the Straits of Florida and assist them if needed. Nelson Morales, now 66, and their mother, Eva Barbas Arango, came to Miami from Havana soon after the 1996 shootdown on special humanitarian visas issued by the Clinton administration. Barbas died earlier this month at the age of 88. The families of the three other victims sued Cuba and received $93 million in compensation, but the Morales family could not join that lawsuit because Pablo was not a U.S. citizen. It rejected an offer of $3 million from the settlement, saying the family wanted only justice. Fidel Castro declared that he took “responsibility for what took place” in a March 1996 interview with Time magazine. He surrendered power to his brother Raúl, who had been minister of defense since the early 1960s, after emergency surgery in 2006. Raúl Castro is heard detailing how he planned and ordered the operation to shoot down the BTTR airplanes in a voice recording made public in 2006 by El Nuevo Herald. The 11-minute, 32-second recording was reportedly made as Raúl Castro spoke off the record to journalists from the state-controlled Radio Rebelde on June 21, 1996, in the northeastern city of Holguín. After El Nuevo published the recording, the families of the BTTR victims that sued Cuba said they had turned over the same recording to the FBI four years earlier — along with a 400-page archive on the shootdown that repeatedly mentioned the recording — as part of their own push for an indictment of Fidel and Raúl Castro. An FBI spokesperson said the bureau never received the recording, according to an El Nuevo Herald report at the time. “Although they claimed responsibility over 17 years ago for ordering the murders of the four BTTR men, Fidel Castro and Raúl Castro have never been indicted or otherwise held accountable in a U.S. federal court for those crimes,” Nelson Morales’ complaint said. Juan Pablo Roque, the spy who returned to Cuba a day before the shootdown of two Brothers to the Rescue civilian planes, says he’s sorry four people were killed. But he maintains Cuba had a right to shoot the aircraft out of the sky. HAVANA — Lt. Col. Juan Pablo Roque wore his Rolex with pride — the unique pride of a Cuban double agent who once worked for the FBI. But now the man who was once one of Cuba’s most illustrious spies is out of cash. And he wants to sell his prized watch and his house in Havana. “I need the money,” Roque said in his most extensive interview in more than 15 years. His story illustrates the uncertain life that awaits Cuban spies whose covers are blown. But it’s also a reminder of the extent and success of Cuban spying even now, 21 years after the Cold War’s end. Roque, a former fighter pilot with Hollywood good looks, staged his defection from Cuba in 1992, swimming to the U.S. naval base at Guantanamo Bay and declaring opposition to Fidel Castro. He became a pilot for Brothers to the Rescue, a group dedicated to searching for rafters in the Florida Straits. But then he stunned everyone in 1996, slipping back into Cuba the day before Cuban MiGs shot down two civilian aircraft flown by members of the exile group. Now 57 and living with his girlfriend in a cramped Havana apartment, Roque said he’s sorry four people were killed in the Feb. 24, 1996, incident. “If I could travel in a time machine,” he said, “I’d get those boys off the planes that were shot down.” The four dead included Carlos Costa, Mario de la Peña, Pablo Morales and Armando Alejandre Jr. Alejandre’s sister, Maggie Khuly, said justice was never done. “Speaking for the families, my family in particular, we’re looking forward to the day when Roque faces U.S. courts on his outstanding indictment,” said Khuly, a Miami architect.